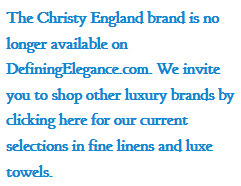 Since 1850, Christy has provided superior quality towels, bathrobes, bed linen and more in a range of stunning colours to suit you. Using only the finest materials, each and every product from Christy is sure to add a touch of timeless elegance to your home. The Christy story begins in 1850 with the invention of the towel as we know it today. Our founder Henry Christy returned to England from Constantinople with a sample of looped pile fabric which was new to the Western World. After studying the fabric along with his inventor brother, a machine was created which allowed terry toweling to be produced on a large scale. A year later, the first terry towel was in production and this was shown at the Great Exhibition in 1851. Her Majesty, Queen Victoria, was presented with a set of these, she immediately ordered more and the rest as they say is history! Today Christy continue this passion for innovation and excellence. Care and craftsmanship through every stitch and loop is at the heart and soul of our brand, the fundamental nature of everything that they do from products, to the way that we want you to feel about them. Exquisitely, obsessive attention to detail is given to all the products we make, all lovingly designed in our UK studio with a contemporary take on English heritage. Christy's legacy is luxury. Their promise is to be the best they can be. They are as excited by their brand today as their founders were in 1850 and look forward to the future with as much enthusiasm and dedication to the Christy brand as ever. Need help? Please call us at 1-800-798-1504 or 973-347-8392 and we will be happy to assist you with availability and pricing.